Try it out, see what you think. 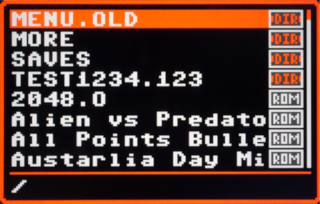 It's a drop-in replacement for the v1.8/v1.9 menu. 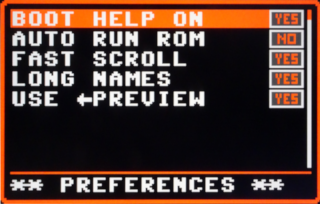 RetroHQ should also have a long file name creation tool for it soon. 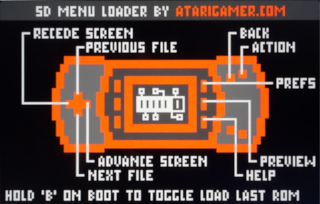 Update (6-Mar-2019): SainT has sent in a few bug fixes that address the EEPROM on SD cart and low power mode that affected some revisions of the Lynx. Also some minor UI improvements were made. The above download link has been updated. Edited by necrocia, Sat Mar 16, 2019 5:24 PM. Very nice! I like the Insert Game screen speed (although there are other new screens to get through!) and I really like the fast scroll, although as I mentioned previously it would be best to have Z looping to A i.e once the end is reached you keep holding down to get immediately to the start. However the recede screen option gets you there pretty much instantly anyway. I don't think I'll have the patience to add the full filenames to each ROM although it would be better to see the full name. Especially with all the weird homebrew/demo titles and different versions with nearly the same title. Z-A looping makes sense, maybe that can be added as a feature for the next version. Incidentally have you had any problems loading any ROMs? Great! No problem loading ROMs! I would say this seems even better still on lynx model 1. It looks like there is a bug with the games that suport save files, they freeze when they try to save. is there a temp way to prevent it? reiko robot run, flappy birds, and lumberjack freeze when the game is over. Only ones i have tested so far with save i think. Also if anyone wants to make up the long names baised on the preview names would be great. I already renamed my roms to the same as the lsd files. Edited by thefred, Tue Mar 5, 2019 7:02 AM. There will be updated versions of my games available shortly with proper saves on the SD cart. Very nice. Can't wait to have my cart. Looks really nice. Gonna install it this weekend. Thanks for supporting the Lynx SD cart!! Any update on the waiting list for this? I've heard that some orders were taken recently, but I haven't ready anything about it. We discovered this bug after release yesterday. It's fixed in the code now (with a few other minor changes), I need to build the new version today. Update will be done by tomorrow, till then sit tight. Thanks for checking it out and reporting this problem! Could you please try that and see how you go? I've asked admin to update the OP with this new link. That took care of the freezing on those 3 games. Thanks for the update. Will all games that have save options have to be patched to be able to save on the SD? If you want games that can save on the SD cart then the game needs to be coded that way. You also need to provide a correctly sized save file on the cart. The Lynx can not create files, re-size files or re-name them. I was planning to make a separate directory for saves. All the sav-files are 128 byte long at startup and the content is full of 0xff as a real eeprom. Patching old games may be difficult. But at least this opens up a new option for making new games. You could easily code a game to use eeprom or SD if they are available. Maybe one day we'll have a real EEPROM on a SD style cart, but until then games have to be written specifically to save to the SD cart. Many thanks for the great work on this new menu. I've had my Lynx SD for ages (got one from the second batch made), but only just got around to fixing my Lynx, and then installing the McWill screen. My SD card is formatted as FAT16, I've copied across the new menu files, and then copied my games in a folder called ROMS. I can't copy them into the root directory, due to FAT16 limitations. 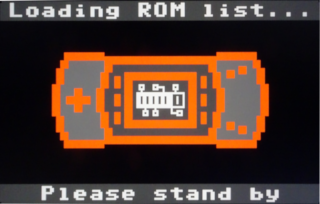 I've also used the MakeRomList tool to create the romlist.txt in the ROMS directory. 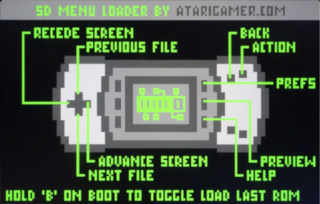 However, when I power up the Lynx, the game titles still show as the shortname in menu. I've checked the prefs, and long names are selected. I was just wondering if anyone can point me in the right direction, as I'm not sure what I've done wrong. Also, I seem unable to use FAT32. If I format the card this way, then all I see is 'INSERT GAME' when it's inserted. Edited by Bagpuss, Sun Mar 17, 2019 4:29 PM. Hey Andy, you need to have the romlist.txt file in the same directory as the ROMs, did you do that? Yes. romlist.txt is in the same folder as the ROMs. Send me a message together with your romlist.txt file and the directory listing on the SD card and I'll have a look. I didn't write the MakeRomList tool so it's possible it could be doing something unexpected. All Roms have to be in the same folder? Doesn't that result in slower menu loading? Can anyone upload a romslist.txt full file? Edited by Greg2600, Tue Mar 19, 2019 11:05 AM. That's not what I said...the romlist.txt file has to be in the same folder as the ROMs. You can have as many folders as you like and in fact there is a limit of 256 files per folder (due to memory restrictions). It's probably a better idea to not have more than about a 100 files in a directory though. The case with Bagpuss was that there were over 300 files in a directory and they all had long names, which caused Lynx memory to run out. Okay, but if I have ROMS in multiple folders, I need to have a romlist.txt in each of those folders, for the roms in those folders? Right now I don't have that TXT file but still have short file names and I'm just stuck on the menu loading. That's right. The romlist.txt file must be in the folder where the ROMs are. If you have multiple folders then you need multiple romlist.txt files. There is no requirement to have the romlist.txt file at all, it's only used for displaying long names. What do you mean you're stuck on menu loading? 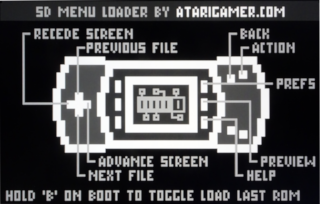 I'm stuck on the Lynx SD Menu Loader 2 screen. The only way I get through that is to remove the roms and the folders they are in. Do they need to be in a sub-directory called ROMS?